This image of the Antennae galaxies is the sharpest yet of this merging pair of galaxies. During the course of the collision, billions of stars will be formed. The brightest and most compact of these star birth regions are called super star clusters. 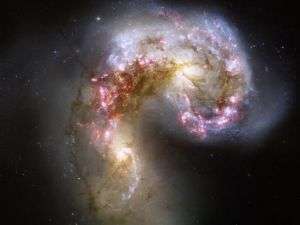 The two spiral galaxies started to interact a few hundred million years ago, making the Antennae galaxies one of the nearest and youngest examples of a pair of colliding galaxies. Nearly half of the faint objects in the Antennae image are young clusters containing tens of thousands of stars. The orange blobs to the left and right of image center are the two cores of the original galaxies and consist mainly of old stars criss-crossed by filaments of dust, which appears brown in the image. The two galaxies are dotted with brilliant blue star-forming regions surrounded by glowing hydrogen gas, appearing in the image in pink. The new image allows astronomers to better distinguish between the stars and super star clusters created in the collision of two spiral galaxies. By age dating the clusters in the image, astronomers find that only about 10 percent of the newly formed super star clusters in the Antennae will survive beyond the first 10 million years. The vast majority of the super star clusters formed during this interaction will disperse, with the individual stars becoming part of the smooth background of the galaxy. It is however believed that about a hundred of the most massive clusters will survive to form regular globular clusters, similar to the globular clusters found in our own Milky Way galaxy. The Antennae galaxies take their name from the long antenna-like "arms" extending far out from the nuclei of the two galaxies, best seen by ground-based telescopes. These "tidal tails" were formed during the initial encounter of the galaxies some 200 to 300 million years ago. They give us a preview of what may happen when our Milky Way galaxy collides with the neighboring Andromeda galaxy in several billion years.